Well it is week 2 of I Heart Cooking Clubs with Ottolenghi & this week it is loving the leaf. All those good for you greens. I turned to Plenty, which I have waxed lyrical about many a time, every time it never fails to inspire. A quick flick through the greens & their are chard & saffron omelettes, a watercress, pistachio & orange blossom salad or a little nutty endive with Roquefort. See...inspiring. Not to mention full of greens so you can check the good for you box too. A close second were the chard cakes with sorrel sauce but they will have to wait for another day as it was these green pancakes with lime butter that won the day & would be a light Sunday lunch. These are packed full of spinach & spiked with a little spring onion & chilli, however what takes these to the sublime is the lime butter, zesty, garlicky, aromatic coriander & meltingly delicious. It possibly a new addiction. It is the perfect friend to the pancakes but I can tell you it is also a very good friend to some grilled chicken & I would imagine it would bond quite quickly with a little grilled fish or steak or over steamed or roast veggies. I think having some of this butter lurking in the fridge at any given time would be a good idea to bring a little zesty kick to many a dish. First, make the lime butter. Place the butter in a medium bowl & beat with a wooden spoon until softy & creamy. Add the rest of the ingredients, mix well, turn the butter out on to some plastic wrap & roll in to a cylinder shape. Twist the ends to seal & pop in the fridge to chill. Place the flour, baking powder, egg, butter, salt, cumin & milk in a bowl & whisk until smooth. Add the onion & chilli & gently mix together. 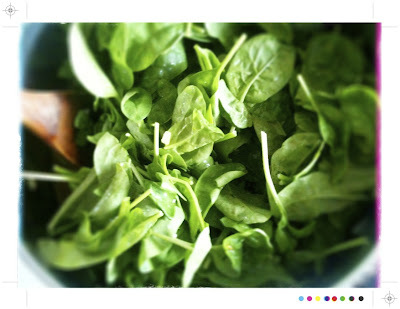 Place the spinach in a large saucepan with a little splash of water over a medium heat & cook until the spinach is wilted. Remove the spinach from the heat & allow it to cool a little until cool enough for you to squeeze dry. Roughly chop the spinach & add it to the batter & mix it through. Whisk the egg white to soft peaks & fold it very gently through the batter, keeping the batter as light & airy as you can. Pour a little oil in to a large frying pan & heat over a medium high heat. For each pancake add 2 to 3 tablespoons of the batter & press down just a little. You’ll have quite small pancakes. Cook for just a minute or 2 each side until golden green. Place the pancakes on some kitchen towel & keep cooking pancakes until all the batter is used up. You can keep the pancakes warm in a low oven. To serve, pile up 3-4 pancakes on each plate & top with a patty of the lime butter. These are just heavenly! The pancakes packed with all that spinach deliver a healthy dose of antioxidants & vitamins & the butter, well that is what makes these pancakes special. It melts & oozes over the pancakes, a little creamy, a little zesty & just a hint of garlic. Go on & make a batch, I promise you won't be disappointed. Mmmm! Savoury pancakes! What a concept! ottolenghi is just so creative! This looks so delicious! I've made YO's cumin fritters a couple of weeks ago and it was a hit with my family! Looks like this will be too! Bookmarked to try one of these days! Oh now cumin fritters I must give them a try, it was sweet potato cakes this weekend so I do seem to be in the midst of a pancake come fritter phase...handy as perfect for breakfast, lunch or dinner! You must Deb, they are just so terribly good...oh & that butter...it is only fair that everyone tries that butter! I marked these to try just because of the lime butter. That kind of attitude probably means I shouldn't check the good for you box...but, well how can I pass up lime butter! Mairi, I've had these pancakes bookmarked ever since I bought Plenty - now I'm really, really wanting them. And I cannot wait to try that lime butter - I'm thinking it would be amazing with some roasted salmon or shrimp, and that a wise person would keep some of this in the fridge at all times .... just in case of emergency!! I love his cookbook but have not tried this recipe yet. After reading this post I definitely will. They look delicious! Mairi, these pancakes are lovely! So inviting and green for spring here. And that lime butter sounds divine! I can't wait to make these - thanks for the inspiration! Oh Hannah you must, these would be one of my all time favourite Ottolenghi recipes! these savory pancakes look so inviting and I have some leftover lemongrass chili butter I had made for a different recipe I think these cakes would go great with it. Thanks Mireille! Noe lemongrass chilli butter sounds amazing!! Does anyone else think that 1 tablespoon of baking powder is too much, especially with self-raising flour? I made them and they tasted a bit soda-ish, although otherwise pretty good. And the lime butter is truly delicious. Hi there, I just followed the quantities in the recipe as I am no master baker! I have to say for me they were delicious, not tasting soda-ish at all. But oh my it is that butter that is to die for!